Holbrook's most notable Route 66 landmark is the Wigwam Motel, the sixth of seven teepee-themed lodges built across the country. But the town has other gems that I discovered on a few visits over the past few years. That includes unrestored stone buildings south of the railroad depot, a filling station (see below) hidden in the weeds and the Plainsman coffee shop. The closed restaurant occupied an interesting midcentury modern building in Holbrook that doesn't match its frontiersman theme. Chester Lewis built the Wigwam Motel in 1950 after visiting Cave City, Ky., where architect Frank Redford built the original in 1938. The Wigwam had radios that charged guests a dime to use them. Lewis paid that revenue to Redford in exchange for the rights to the Wigwam concept. Lewis sold the Wigwam in the 1970s but his family bought it back in 1988 after his death. The other remaining Wigwam motels are in Cave City and San Bernadino, Calif.
Holbrook's other vintage motels include the 1956 Globetrotter Lodge on Route 66. It is still hosting globetrotters while many other motels and motor lodges in historic Holbrook have given way to chain motels on Interstate 40. The Plainsman neon sign still stands but the 1966 coffee shop is closed. 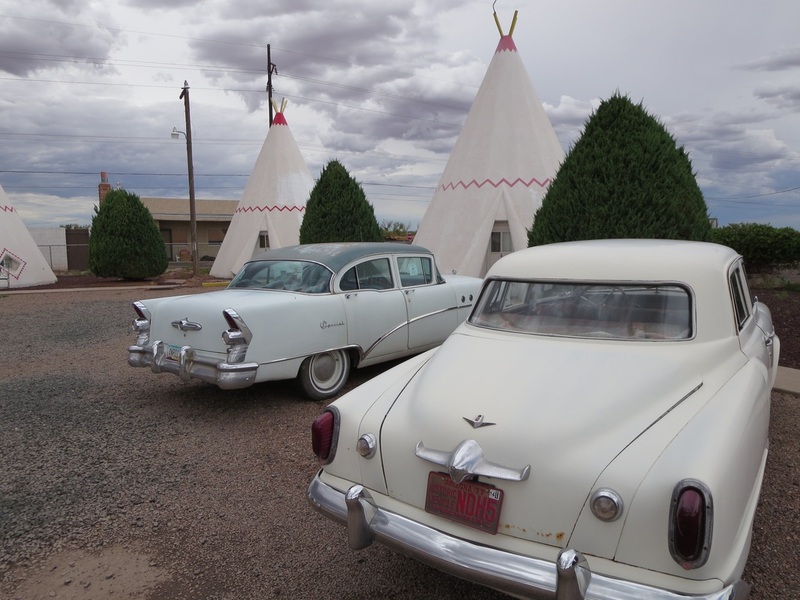 A classic Buick and Studebaker are part of the decor at Holbrook's 1950 Wigwam Motel, one of seven tepee-theme hotels. Chester Lewis saw the original Wigwam Motel in Cave City, Ky., designed by Frank Redford, and decided to build one on Route 66 in Arizona. This muffler shop was originally part of the popular Forest Cafe and Motel. A forlorn filling station with carved wooden pillars hides in the weeds. Holbrook, once thriving with Route 66 traffic, was thick with gas stations and shops selling tourist trinkets. Petrified Forest National Park is 20 miles away. 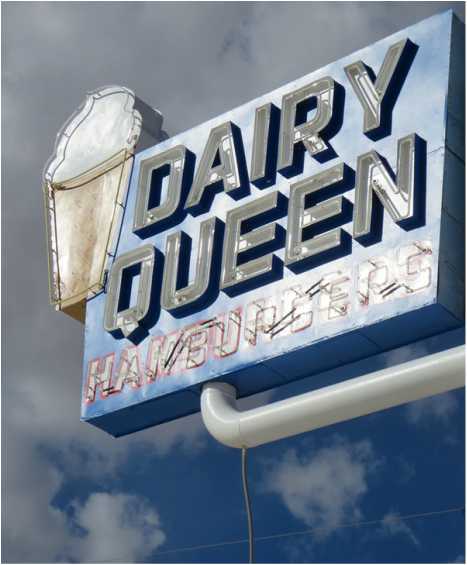 Dairy Queen still has an old style blue and white neon sign in Holbrook. 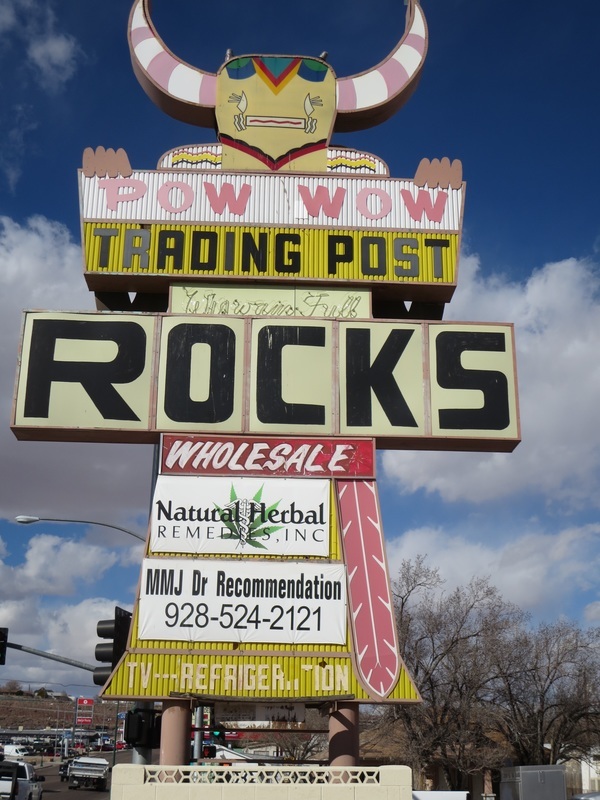 Pow Wow Trading Post has added herbal ventures to its towering sign.